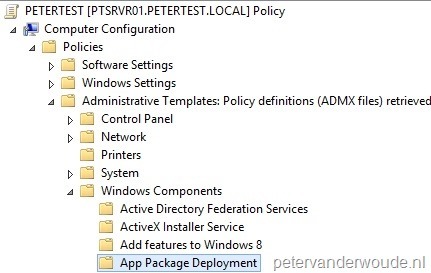 This week I was planning on doing a post about deploying a Windows app package (.appx) on Windows 8, until I saw that Keith Mayer already just posted a Step-by-Step for that. As that post is, from a ConfigMgr perspective, already very complete, I changed, from my original plan, to troubleshooting the deployment of a Windows app package (.appx) on Windows 8. The deployment of a Windows app package (.appx) on Windows 8 requires two specific settings and in this post I will describe those settings and the errors that will appear when these settings are forgotten. In-line script returned error output: Add-AppxPackage : Deployment failed with HRESULT: 0x800B0109, A certificate chain processed, but terminated in a root certificate which is not trusted by the trust provider. (Exception from HRESULT: 0x800B0109) error 0x800B0109: The root certificate of the signature in the app package must be trusted. 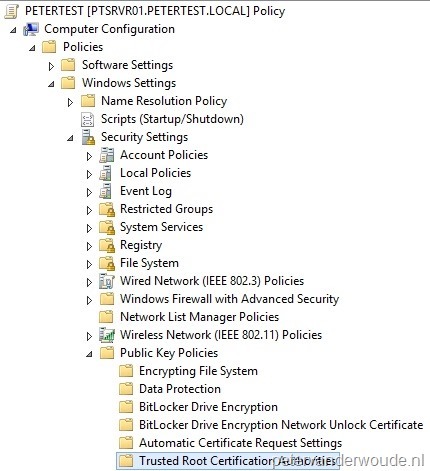 Open the Group Policy Management Editor and navigate to Computer Configuration \ Policies \ Windows Settings \ Security Settings \ Public Key Policies. Right-click Trusted Root Certification Authorities, select Import… and the Certificate Import Wizard will show. On the File to Import page, Browse to the certificate and click Next. In-line script returned error output: Add-AppxPackage : Deployment failed with HRESULT: 0x80073CFF, To install this application you need either a Windows developer license or a sideloading-enabled system. (Exception from HRESULT: 0x80073CFF) Deployment of package bc25cdcc-f901-4f91-91a7-55a74a247376_1.0.0.0_neutral__tbz3402trp7yy failed because no valid license or sideloading policy could be applied. A developer license (http://go.microsoft.com/fwlink/?LinkId=233074) or enterprise sideloading configuration (http://go.microsoft.com/fwlink/?LinkId=231020) may be required. Open the Group Policy Management Editor and navigate to Computer Configuration \ Policies \ Administrative Templates \ Windows Components \ App Package Deployment. Double-click Allow all trusted apps to install, select Enabled and click OK. Note: Before the app package is a trusted app package, the (root) certificate, that is used for signing the app package, has to be trusted. Very useful tips, thanks Pete.